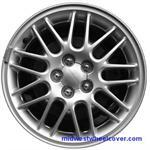 59141, Used Rims, 390x165mm, 5 LUG, 120MM,,82-88, BMW, 524TD, 528e,533i, 535i, ALLOY 18 SPOKE RIM. 68697a, Used Rims, 16X6-1/2, 5 LUG, 100MM, 97-04, SUBARU, LEGACY, SILVER, 18 SPOKE, ALLOY. 7005, HUBCAP USED, 15", 98-00, FORD, CONTOUR. SPARKLE SILVER, 4 LUG NUT HOLES, 18 SPOKE. BLUE CENTER WITH FORD LOGO, PLASTIC CLIPS & WIRE RING.